The Hugo Germino Sports Ambassador Award was established to honor deserving citizens who have spent an exceptional amount of time promoting, coaching, and working with young people in various sporting activities in the Durham community, without recognition. We feel these individuals deserve credit for taking their time and interest to promote athletics, fun, and happiness for so many people without expecting any pay or personal accolades. Hugo Germino was the perfect example of such an individual. 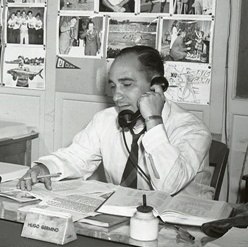 Hugo joined the Herald-Sun newspaper in the mid 1930s and became Sports Editor in 1938. He also had a sports program on WDNC radio every day and he was an announcer for the Durham Bulls’ home games. He always wrote positive things about teams, players, coaches and their families. He helped start the Herald-Sun Golf Tournament in 1940 and served at each tournament until his death. Germino helped establish the Triangle Seniors Golf Association. He served as President of the ACC Sports Writers Association and on the Board of Directors of the U.S. Basketball writers Association. Hugo was president of the Durham Jaycees and the Sertoma Club in Durham. He organized softball games for British sailors while their damaged ships were being repaired during WWII. People enjoyed his daily sports articles, simply because they were written from his heart in a positive manner, and with a local flavor that readers could relate to. Hugo Germino was a true sports ambassador!